The clear stream 2Max uses patented technology to receive TV signals 60 miles away from broadcast towers. With quick-connect parts, the assembly only takes a few minutes. Its unique integrated diplexer for UHF and VHF reliability, receives broadcast signals through heavy foliage or roofing materials in your attic. The clear stream 2Max is whole home ready, so if you had satellite or cable service, the coaxial cable needed to send the antenna's signal to all your TVs is already installed. There are also many advantages to an outdoor antenna over an indoor antenna. An outdoor antenna will have fewer obstructions and less interference (noise) from electronics devices in your home. 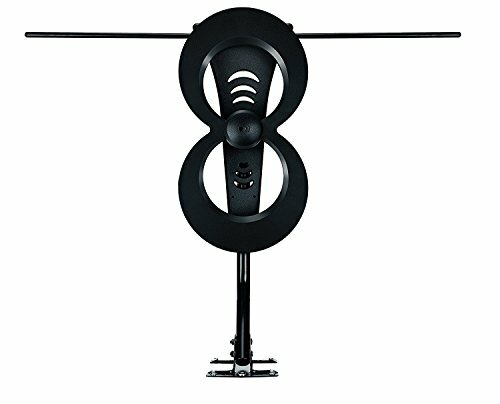 The clear stream 4Max HDTV antenna comes with a lifetime warranty on parts to assure you of the superior build quality and durability. Includes clear stream 2Max antenna, 20” J-Mount, all-weather mounting hardware, sealing pads, and instructions (coaxial cable sold separately). If you have any questions about this product by Antennas Direct, contact us by completing and submitting the form below. If you are looking for a specif part number, please include it with your message.